In the age of unlimited information, where every question that pops into your head can be answered in just a couple of swipes of a smartphone, it sometimes proves difficult to muddle through the ocean of data and decipher what is actually credible information. This issue is particularly highlighted by blogs. When you search almost anything on google, on the first page of the results, there is bound to be at least one blog article. Now while these blogs may seem like they were written by honest individuals who want to provide you with the facts, more often than not, there is something lurking beneath the surface. Most blogs implement some form of affiliate links in order to help finance their interests. This is especially true of blogs comparing various products across different brand or company spectrum. Typically, the more money an affiliate company is willing to dish out to a blogger, the more likely that company's product will end up being ranked higher than the competition within that blog. First let's break down where affiliate links come from. What is "affiliate marketing" and how does it work? Simply put, affiliate marketing is the act of a company or merchant, permitting someone or some organization (blogger, small company, etc.) known as an affiliate, the use of a special link (affiliate link) that connects a third party (customer), to their product. If a potential customer clicks on that affiliate link, the company that issued the affiliate the link in the first place, will give the affiliate a commission on all actual purchases generated from the traffic through the affiliate link. The more sales you can generate through your link, the greater the commission. This is commonly referred to as affiliate marketing. There are three parties transacting in this equation. The first one being the company creating a product or service; the party that needs help selling their product. The second party being the affiliate; the person or organization trying to garner sales of a product on behalf of the company. And finally, there is the third party; the customer who is ultimately buying the product from the company, through the affiliate. The point of this article is not to call into question, the act of affiliate marketing, but rather to address what happens when blogs or websites attempt to conceal the affiliate links in order to appear genuine and uninfluenced by outside forces. This type of act goes by many names including hidden affiliate links, link concealing, and cloaking. These hidden affiliate links should give us, as users, pause. Because it means that the what theses bloggers and websites are writing about specific topics or products (Ex. 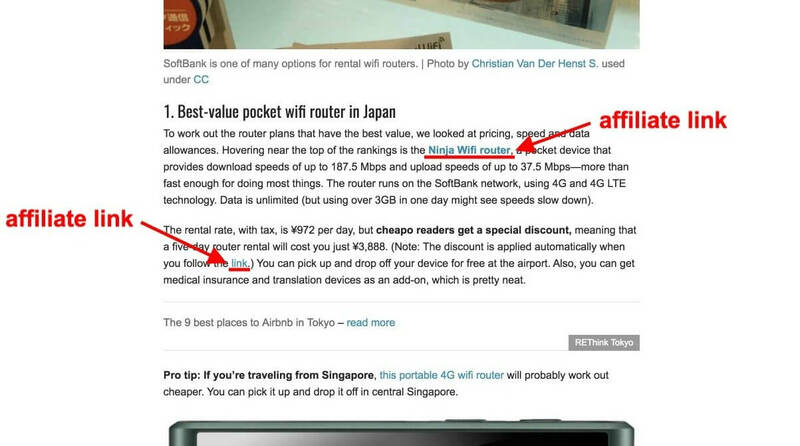 Pocket WiFi rental companies), needs to be read with a healthy dose of skepticism. Now with the idea in our minds about how hidden affiliate links may be affecting judgement without our knowledge, lets delve into how to recognize when hidden affiliates are being used by looking at a couple of examples. This affiliate-merchant relationship is an important thing to consider when shopping around for any product. 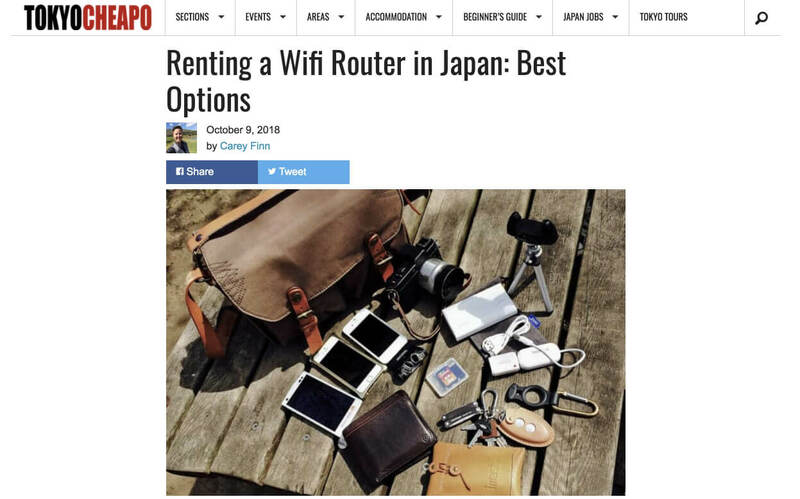 In this article we are focused on renting portable WiFi routers in Japan so we will use that as an example. 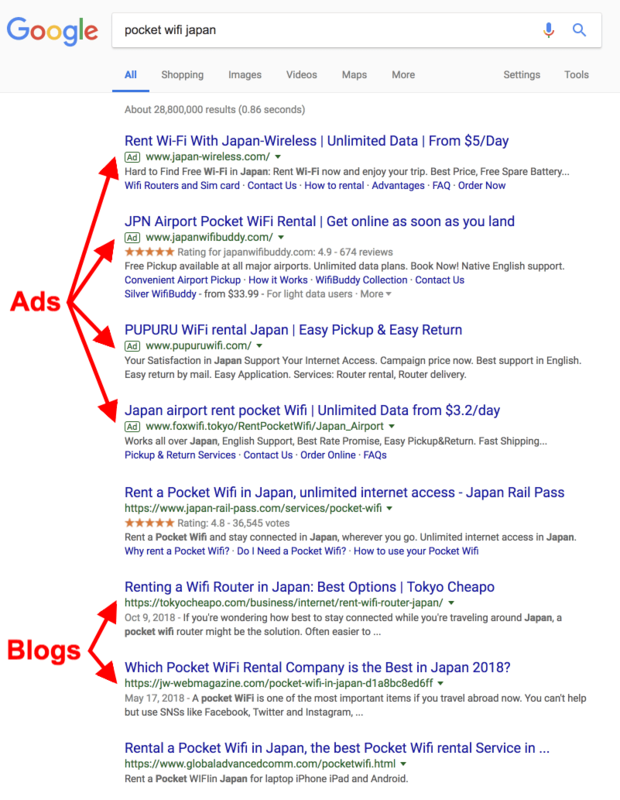 If you do a quick google search of "pocket wifi japan" or "japan pocket wifi rental", a bunch of clearly denoted Ads will pop up on the top of your search results, followed by a number of blog articles. The ads are easy to recognize because they have the word "Ad" written clearly to the left of each web address. Now let's look at the first blog post. This one should be easy to spot because it's not that well hidden. Clearly an affiliate link that calls into question the bias of the writer in favor of this particular provider. Again here is another example of an affiliate link for the company Ninja WiFi. To see the actual names for the links inserted into the article, you have to check the websites source code. 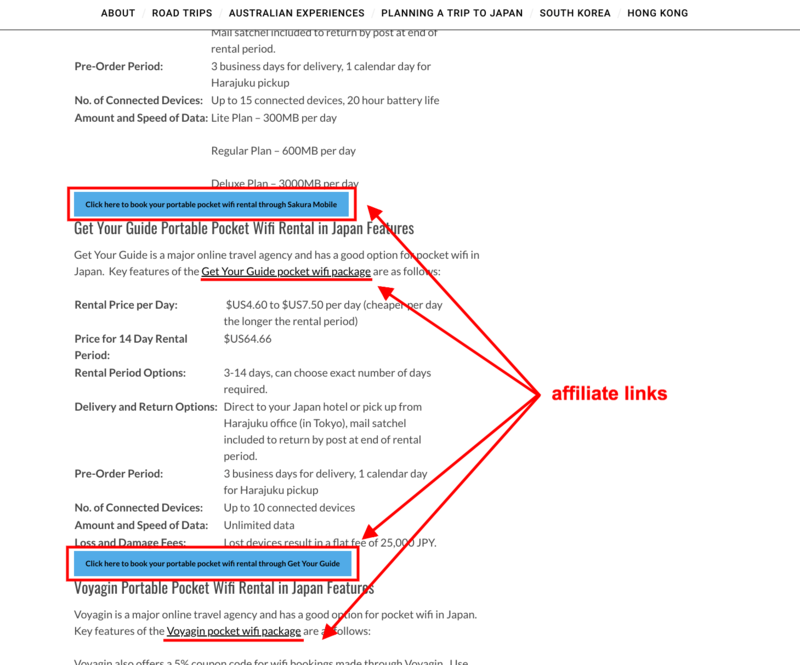 Here is another example of a blog implementing affiliate links. 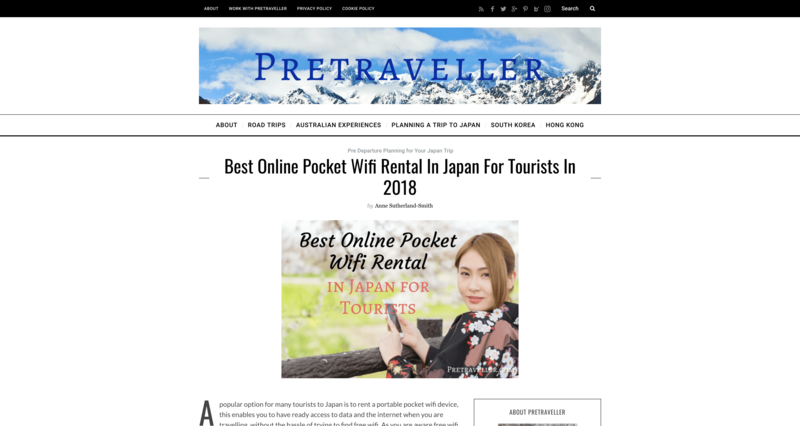 It's called Best Online Pocket Wifi Rental in Japan For Tourists in 2018. This article has more than 10 affiliate links. "Disclaimer: This article contains affiliate links. If you book after clicking on one of these links then we may receive a small commission at no extra cost to you." This is another way to find out quickly whether or not affiliate links are being used, just look for the disclaimer. As I said before, reading blogs about products like mobile WiFi rental, requires a dose of skepticism. You need to consider some things while reading through them. For example, what is the motivation behind the product selection and ranking. Are these blogs advertising these specific companies because they believe wholeheartedly that they provide great products or services? Or does it have more to do with the amount of money the company is willing to pay them for their affiliate relationship. It could also be a mixture of both. Don't get us wrong. We are not against affiliates. All we want to say is that you, as a reader, should be aware of the fact that not all information you get from these blogs is as genuine as it may appear. Whether or not you trust those blogs, it's always worth a time to check if there are actual verified reviews for a product on it's website. Information from actual people who have used a product can be very beneficial and subject to less affiliate marketing related bias. Here at eConnect, we have almost 2,000 reviews for our Pocket WiFi. Those are the real voices of the customers who rented our product. So if you have time go take a look for yourself. 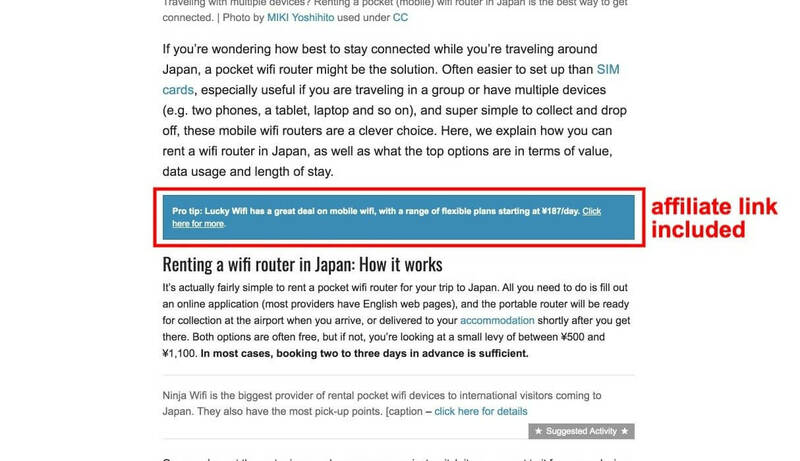 Tested: Does Pocket WiFi work on Shinkansen? We here at eConnect took one of our Pocket WiFi routers onto the Shinkansen to test its capabilities at these high speeds and long distances. Our test run for this trip was from Shin-Osaka to Tokyo. If it isn't clear by now, a Pocket WiFi provides you with the mobility and connectivity that none of the other Internet devices can provide you with.